I promise to write less this week, not just out of respect to others but as a necessity to my sanity. It has been and is the week of all weeks: 270 MS reports are due in and I am slowly becoming snowed under. Thinking ahead to my UBD planning on Sustainability, it was good to read about other projects that involve reaching out globally. As I followed the links to the multiple readings my mind started remembering projects I had followed or read about that focused on creativity and were clearly centred around the Arts. 4 years ago I stumbled on an online project called One Million Bones. As I was taking a Grade 8 unit teaching about sculptural materials and some of the students had returned from a history trip to Vietnam talking animatedly about the atrocities of genocide it seemed apt to get involved. The concept of the project was to encourage groups of people to make “bones” and send them to become part of an Installation to be set up in the National Mall Washington. On the website, Naomi Natale talks about how the project and the organisation The Art of Revolution are”dedicated to leveraging the power of art to inspire activism. We believe that art is such an incredible tool with which to engage and mobilise communities around a specific social justice issue. It offers a tangible way for people to connect to things that are not presented to them daily. It was humbling to have been a tiny part of such a powerful piece of collaborative art. On a lighter note, collaborative projects have been a part of artists work for some time, from Ai WeiWei’s powerful installations built from information and research gathered collaboratively to Spencer Tunick‘s body sculptures. Tunick crowd sources willing participants to offer their bodies to become part of one of his pieces in particular places around the world. He counts on the public to respond, and they always do. One such colleague of mine had suffered with breast cancer many years previously and decided this would be her moment to embrace the situation, her mastectomy, and become part of history. She said it was liberating and she was proud to have been part of the Selfridges artwork. On a very different note, the Inside Out project asks the public to share their portrait where the photography project is to take place – London, Georgia, Paris, Karachi, New York and many more. 8572 locations to be exact. JR, speaking at TED, remains largely anonymous yet he wants his large pastings themselves to speak out so that the viewer can contemplate the story behind them and to raise questions. It was through searching these projects that I stumbled on a new one, Make a Forest, a collaborative art project aimed at groups worldwide to share an artificial tree and together to build a forest that raises awareness of diversity of our world trees yet also of their fragility on today’s society. My Grade 6s earlier this year were looking at trees in our school grounds that reflected the 40 years of their existence, the stories they tell and the lives that have passed them by. 40 trees for 40 years is a project spearheaded by Frankie Meehan and Nathan Hunt, both keen on sustainability and who have inspired my direction with art. Reading about the individual projects on the Make a Forest website led me to think how I could involve my young artists in this humble online project. 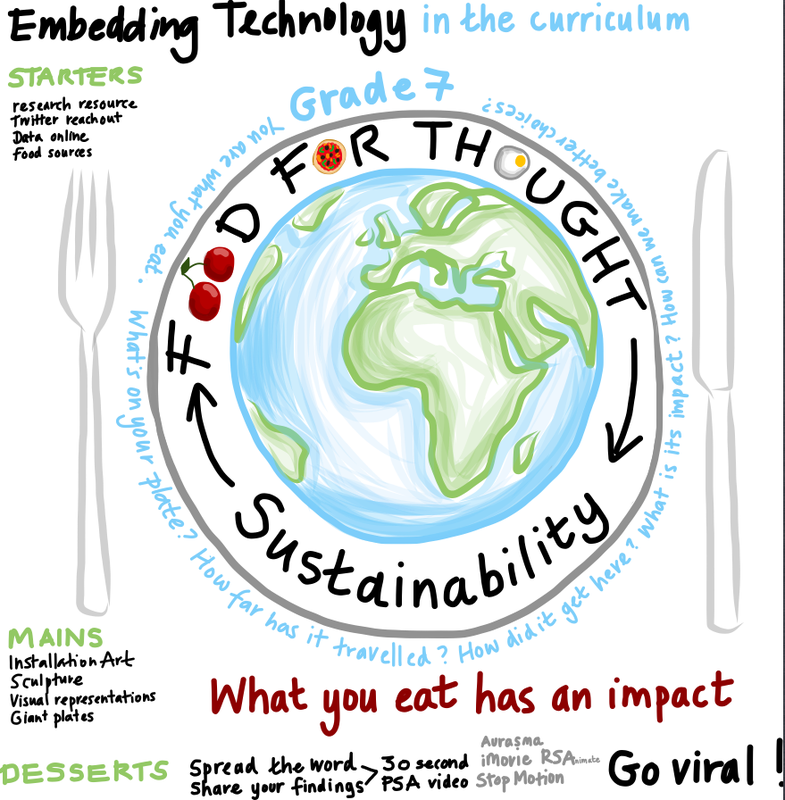 It is with this sentiment that I work on my Sustainability unit with Grade 7, with this power of harnessing interest around the world in our common cause to live in a better one that fires my energy to impart important causes to our students, the future citizens of our fast diminishing world. I may be one person but together we can make a difference, if we all try. In the mean time, I have a simple art idea to test out this remix society and the importance of creativity. Do you recall artists trading cards? Little baseball sized cards given or sent to be swapped. I thought in today’s digital world we could create art, on iPad or iPhone and digitally send these to interested artists (or students). There they would remix, add to or change the artwork and send on again. How fun would it be to see your artwork travel the world, change and alter and then be exhibited online? Do you want to help me start this? If you know an art teacher, artist or someone creative or just keen to be involved tell them. Tweet me at @itsallaboutart with hashtag #artremix and let the creativity begin. **update: I don’t think I wrote much less in the end, but I wrote it quicker! Hi Nicki, I LOVE your visual notes, I wish I could express myself that way! I’m thinking about all the things you talk about in this post (and I love Ai WeiWei’s Never Sorry and I think back to all the happy time I spent with you and the Singapore crew watching everyone’s favourite films – happy times!) and it amazes me how small the world becomes when we start to collaborate. I think that is what is missing most from my own current practice – great things are happening inside the school but we haven’t yet made the jump to connecting and sharing with others. And the idea of the Arty Remix intrigues me, I hope you post how the project goes so I can follow along! Oh Louise, I miss you, your smile and energy. Just remember you were the one who started my visual note taking off all that time ago at the tech mentors retreat – happy days! That day changed the whole of my direction in so many ways, meeting everyone and starting new friendships, ideas and innovations. I often wonder if I hadn’t been invited how different my life/teaching/future would be. I would love if you join in on the #artyremix. 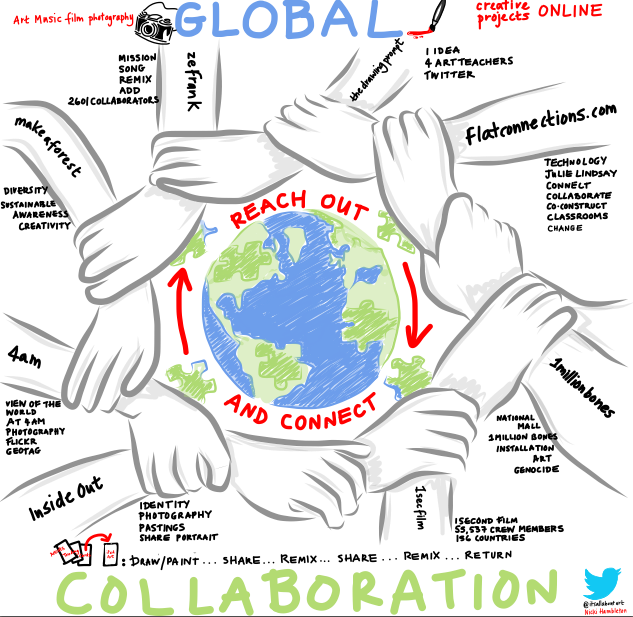 I am not sure how best to share the images and collaborate to involve others online – any thoughts?! I need to steer away from sharing via email I think as it would alienate so many visitors to the blog. Do you know of an app that would share if people joined the group. What’s app – would that work? Thinking out loud here…..
You have a huge PLN to connect with, it’s just deciding what to collaborate on. Let me know how I can help. Can I just say that you have incredibly lucky students? Like Louise, I’m looking forward to seeing how these ideas come to fruition. I’ve shared this blog and Matt McGrady’s with the art teachers at YIS and will encourage them to find ways to get our students to join in on the fun! Thank you so much Clint, I would love it if more people want to get involved in the remix! I just could do with the perfect format to share this project. Essentially it would need to be accessible enough for people to quickly join, then upload an image but also easy for them to download, rework and upload again in order to track the progress and journey of the image and who has participated. I have had some suggestions through Twitter of using Pinterest or Glassboard but I want to avoid email invites as this will be very time consuming for me to do each time a new student or class wants to participate. As a techie expert – what would be the best way forward and have you any experience of something similar to this before with any platform? Google+ community? (but our kids are not on it yet at UWC). I would love to start it soon and Matt’s kids are keen but I want to get it right from the start! Any help would be so great! Could you use a shared Pinterest board or hashtag Instagram pics for this? (#remixart #artyremix) This would make it VERY public. and it would be visual with being unwieldy and others could be inspired from others! Great original and fun idea! I like these ideas! Thank you. If I make a Pinterest board how do people ask to be added or collaborate – would that involve emailing? Instagram could work too although downloading an image from there isn’t at a very high quality to then remix. Google folder would work for sharing though but not very pretty. I guess I could then blog/instagram/Pinterest the results? A Pinterest board can be made public which just requires a link, people will need a Pinterest account to add to it. What about flickr as an alternative to uploading/ downloading images for remixing? Different sized files available, with the ability to add licensing information (ie CC). and the ability to have different sets for remixing results…. A google folder may be a bit messy once you have many people involved. Just hav e to add to the chorus that I *LOVE* your visual thoughts! After witnessing them being made at the IBAP conference and enjoying the RSA clips for years, I’m always super impressed by anyone who can do this. Amazing stuff! Thank you Lennox! I spend multiple hours tweaking them and would really struggle to do them live. I tried at learning 2 last year and it is so difficult, keeping up and producing something visually representative. I have the hugest respect for Graphic facilitators!